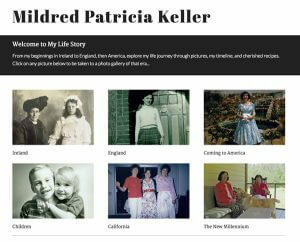 My first online memoir was my mother’s which I had to extract from old pictures and my memory. Due to illness, she was not able to contribute much. Her online memoir is primarily pictorial, with few stories and no audio or video to enhance it. You may take a look at her site here: demo.lindabugbee.com. It turned out to be a beautiful website, but I had a deep desire to create something better. One day I told my friend, Linda, about my online memoirs and she eagerly agreed to be my guinea pig. She loved the idea of finally telling her and her grandparents’ stories and passing them on to her 10 grandchildren. My friend had repeatedly attempted to write her memoir, but came up against obstacles every time. Whether it was determining how to organize her stories, figuring out which to include, or getting lost in the details of finding the right words, the memoir never really got started. These obstacles fell away when we began to work together. Instead of being overwhelmed by the enormity of the project, my process helped to structure and encourage her every step of the way. 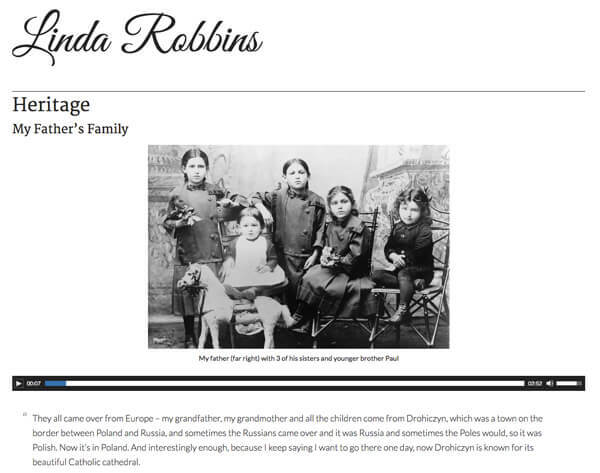 As always, the project started by gathering some basic information - having Linda complete a questionnaire about her ancestors, her family, and the major milestones in her life. Using this basic information I created her timeline -- the overview of her life that leads to a framework to support the work that follows. Would you like to learn more about Online Memoirs? Sign up to be the first to know when my method for creating online memoirs is available to the public! Next came the interview. Once we were sitting down together and talking about her family, the stories flowed with ease. With the recorder going, we talked about what she would like to say to her grandkids as well as what her father would think about her kids and grandkids now. She told the story about her father, Papa, who worked so hard in his laundry shop so that his children wouldn’t have to. When his son (Linda’s brother Bert) became a doctor, Papa was so proud, but then disappointed when Bert went into research. He’d say, “Linda, why does he have to do research? Why can’t he have an office and get rich?” She told me her brother’s heartwarming reply -- that when he first worked with pediatric leukemia patients and learned they had only months to live, he decided to go into research. “I can take care of them, but I want to do something more.” Papa had sacrificed for his children. Bert made sacrifices for his patients. The next step was to gather some of her favorite pictures. Typically, people’s best photos are the ones they’ve framed and scattered around the house. 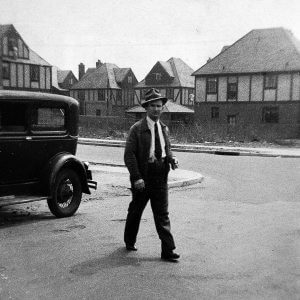 As we went about her home collecting pictures, she told an interesting story about nearly every one. Fortunately, I recorded these stories and used them for detailed captions and audio narratives in her own voice. 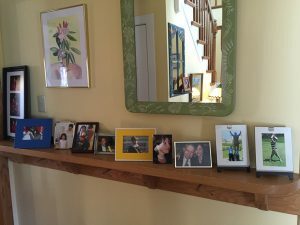 Over time, I continued to collect Linda’s vignettes and photos and started weaving them together into a cohesive representation of the rich lives led by her and her family members. This screenshot of the home page shows the major categories of her life (which we put together after our first interview). I love seeing her age so beautifully in the pictures. By clicking on the first picture, we come to the first category: Heritage. 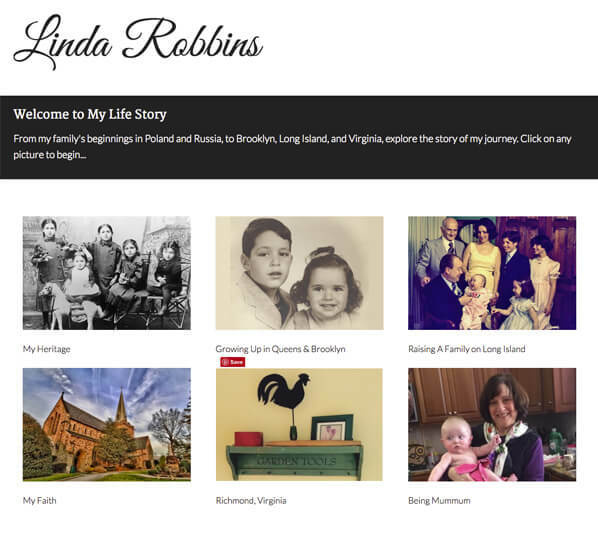 This page displays a combination of stories, pictures, documents, and audio of Linda telling the stories she remembers about her grandparents. The audio adds extra depth and understanding, giving a more traditional storytelling feel. Although this online memoir is still under construction, you may visit the Heritage page by clicking on the picture above or clicking here. Being able to see her story come to life has had a wonderful effect on Linda. Watching the progress has kept her excited and helped her remember and relive the stories of her family. She is motivated more than ever to complete her online memoir. By working through my process, she will be able to share her memories in a multimedia format that her grandchildren will love. Unbelievable!!! Where do I sign up? Lovely. An interesting addition perhaps : you can add a widget to your website that would allow visitors to phone in their own reactions and memories – see my website for one example of this. The message is recorded in mp3 format so could be added as online content. Imagine the layers of memories and sharing possibilities. Ex : Aunt Jeanne comes to the website, reads about her sister’s wedding day and phones in her own memories from that day. Michelle, that is a great idea! I’ll check out your site and see how I can add audio comments to mine. Thanks!